(Nanowerk Spotlight) Point-of-care diagnostics, food safety screening, and environmental monitoring will massively benefit from the label-free, inexpensive, rapid, handheld sensor devices that are currently under development. During the past few years, research efforts have been devoted to maximizing surface-enhanced Raman spectroscopy (SERS) signals from molecules located inside or near nanoscale gaps between plasmonically active metallic nanostructures on the SERS substrates. 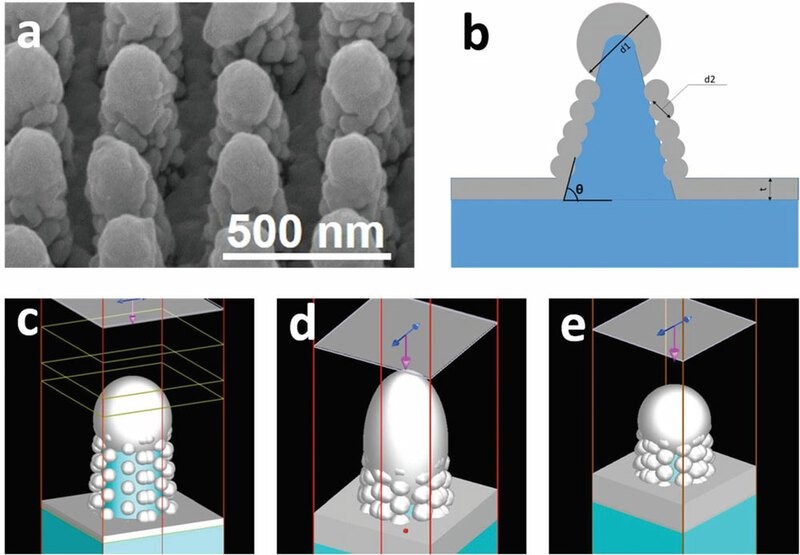 In SERS the Raman effect is found to be greatly enhanced when it is close to a rough metal surface consisting of gold or silver nanoparticles, due to surface plasmon resonance. In recent years it has been demonstrated that single-molecule detection with SERS is possible. Developing these impressive research results into large-area plasmonic sensing platforms has been a major challenge, though. "To date, there has been a lot of work reported on either SERS or plasmonic sensing but very few have reported sensing with the same device for both SERS and plasmonics, let alone plasmonic colorimetry naked-eye sensing," University of Illinois alumnus Zhida Xu tells Nanowerk. For the first time ever, researchers at the University of Illinois' Micro and Nanotechnology Lab, led by Logan Liu, have reported the combination of naked-eye plasmonic colorimetry and high-enhancement and high-uniformity SERS in one sensor. They call this dual-mode sensor FlexBrite. 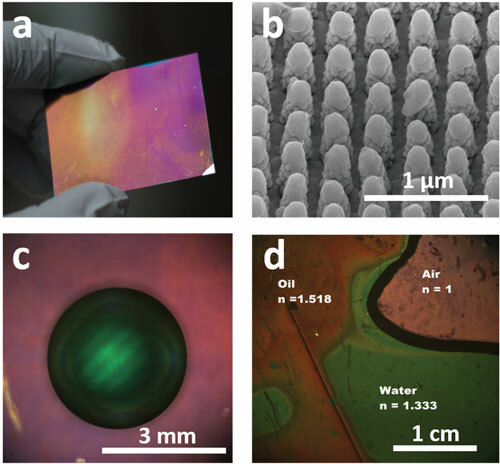 The team reports their findings in Nanoscale ("Large-area, uniform and low-cost dual-mode plasmonic naked-eye colorimetry and SERS sensor with handheld Raman spectrometer"). "What has motivated us is we want a label-free photonic sensor which can take both qualitative and quantitative measurement," recalls Xu, who first-authored the paper. "SERS is good at qualitative but bad at quantitative analysis, while plasmonic sensing has the opposite characteristics. So we designed the structure with excellence in both functions." The revolutionary method of label-free molecule detection developed by the team can easily answer what substances, and how much of each, are in a liquid. "At first glance, FlexBrite is a thin, bendable, plastic-based wafer that shines purple in the light," says Xu. "At the nanoscale, however, it’s crisscrossed with tiny bumps. We call these structures 'nano-mushrooms', which bend the light reflected off them and account for FlexBrite's color-changing properties, allowing researchers to analyze liquids much more efficiently." "We conducted a lot of research and simulation to design this 'nano-mushroom' structure in order to obtain its unique properties," explains Xu. "'The plasmonic color shift of FlexBrite induced by refractive index of liquid is so drastic that it can be detected by the naked eye, making the testing equipment very simple and low-cost. Even a cellphone camera can be used to analyze the color shift." As a result, FlexBrite can be used to tell what's in a liquid and how much of each substance there is, even down to trace amounts if a handheld spectrometer is used. Detection of chemicals in liquid can be quickly done and the concentration of chemicals in liquid can be quickly measured. Applications include finding pollutants in water; detecting trace amounts of the narcotic methamphetamine in a drink; or determining the amount of ethanol in gasoline; all within 1 minute and at very low cost. The researchers say that their current fabrication process for FlexBrite results in unit cost of about US$ 2 per square centimeter. This compares very favorably to the $40-$120 cost per chip of SERS sensors on the market today. "With mass production processes the cost for FlexBrite could be brought even further down," says Xu.